Dungeons and Dragons | . : Greg Campbell | Game Designer : . In this corner is the reigning champion, terror of the skies of Xeen, destroyer of the righteous kingdom of Honnalee, and gimmicky battle, the Dracolich! And in this corner, 7 challengers from Xeen wish to unseat him from his throne, armed with the D&D version of flying giant mecha built by a slightly insane Wizard with a fixation for boots. Download the D&D 3.5 stat blocks! 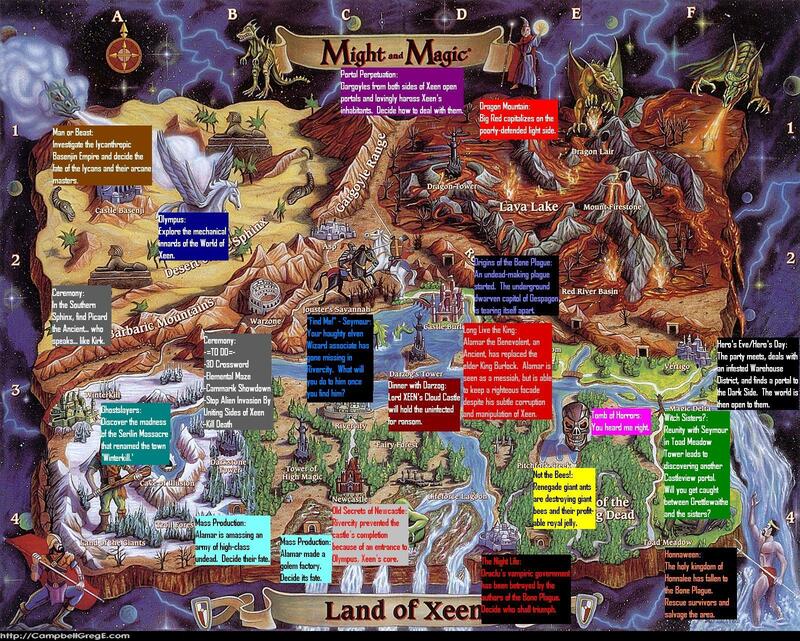 Here are the maps for the flat world of Xeen. 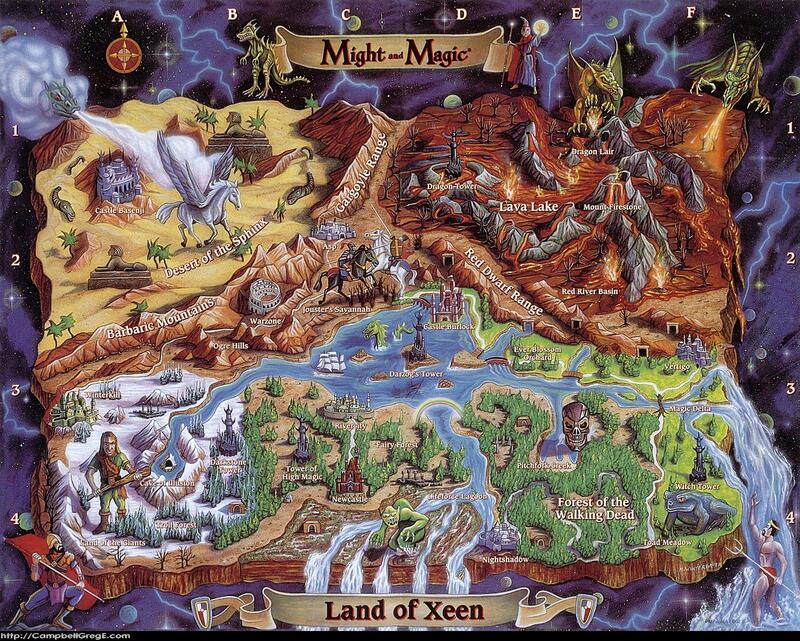 New World Computing‘s game World of Xeen was a heavy inspiration for Greg’s Xeen campaign. Click the thumbnails to view the full images in a new window, each about 1600×1300. Don’t let YOUR game stall when your Pathfinder Wizard needs the source for some obscure spell! Use Pathfinder Spells for a Faster Tomorrow! Greg still devotes time to giving back to the community. Game Masters and players alike can benefit from a greater understanding of applied D&D mechanics. Standing there and swinging a heavy weapon as a big, dumb brute may work in other situations, but this is D&D 3.5! Now, a front-liner needs mobility to go anywhere and get the drop on his opponents, the reach to go against the big bruisers twice his size, and the damage to kill most things before they can act. Fortunately for you, I’ve done all the heavy lifting. My Hood guide explains what you need to stay relevant through all levels! Run on walls and stand on ceilings. Jump, glide, and fly your way into position. Deal enough damage to kill even greater gods in one hit if you can bypass their defenses. Being a dragoon is modular. If your damage is too high, tone it down. If you feel too slow, this guide gives you ways to ramp up your speed. It’s your character after all; the tale you tell is up to you. Download Hood: A Tale of and Guide to the 3.5 Dragoon! All this material is used without permission from its original author(s). 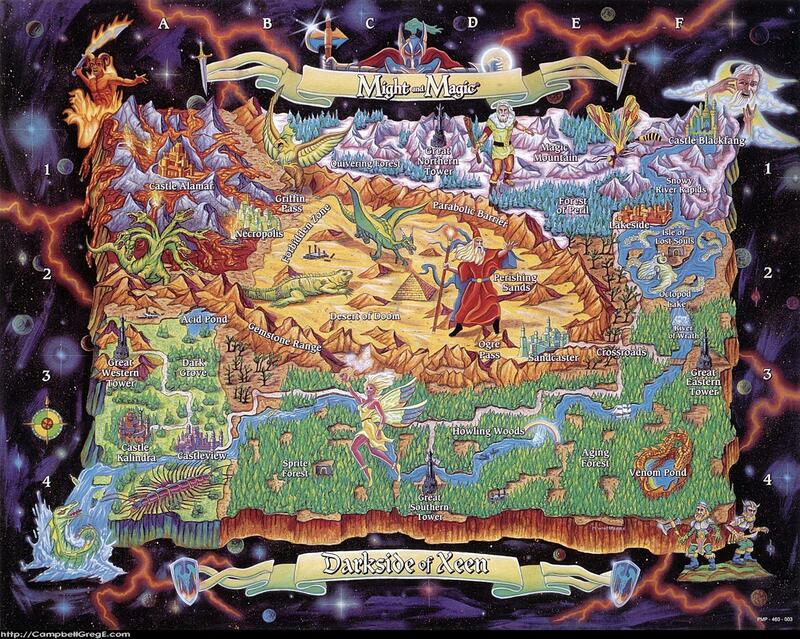 Dungeons & Dragons and its associated media are property of Wizards of the Coast and Hasbro. Pathfinder and its associated media are property of Paizo. The dracolich image was drawn by Fred Hooper for Wizards of the Coast. The sky golem image and World of Xeen logo are from World of Xeen, a game by the now-defunct New World Computing. The track Winged Fury is part of the Vampyre CD by Midnight Syndicate. The dragoon image for Little Red Raiding Hood was from Final Fantasy Tactics, a game by Square-Enix. All other material not belonging to another entity is property of Greg Campbell.